Filed to: KaBlam!Filed to: KaBlam! Nickelodeon’s heyday is often remembered for its tentpole programming, stuff like All That, Rocko’s Modern Life, and Rugrats. Amongst those bigger titles, however, was a bunch of smaller, weirder stuff that’s often left forgotten (even by ‘90s kids). 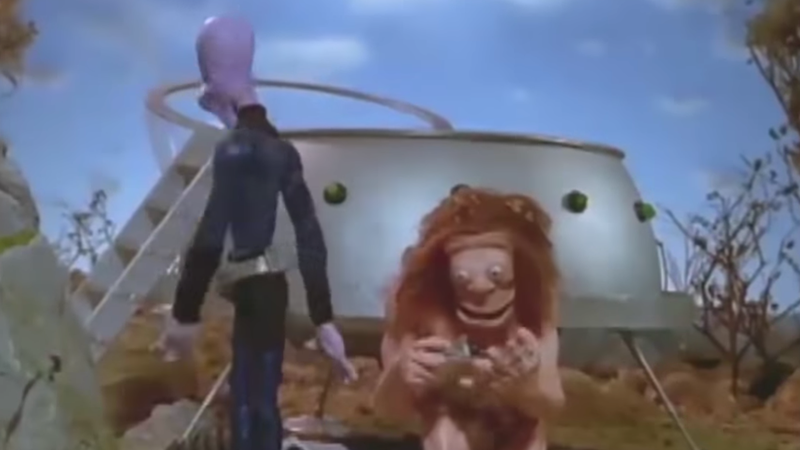 Take, for example, Prometheus And Bob, the stop-motion short from the animation anthology KaBlam! that featured an alien attempting to teach a caveman the basics of human life. Remember that? Most people don’t, but creator, director, and voice actor Cote Zellers certainly does. Recently, Zellers sat down with AJ, the self-professed Prometheus And Bob super fan behind YouTube’s Cult Popture, to delve into his experience making the shorts and why his planned Prometheus And Bob feature never made it past development. After getting some attention with an original, edgier Prometheus And Bob short, Zellers was tasked with creating a new, kid-friendly episode for KaBlam! every week. While the stop-motion process was painstaking, it also gave him complete creative control over the show’s aesthetic and humor. That changed, unfortunately, as the shorts’ popularity increased. “I went to Paramount and had a meeting with Amy Heckerling and her producer. She was going to direct it,” Zellers says of Nickelodeon’s failed attempt to get a Promotheus And Bob live-action feature off the ground. “It was supposed to star Chris Farley and David Spade…but then Chris Farley died.” Inexplicably, the development process continued to move forward, and a script was written that Zellers calls “the worst thing [he] ever read.” Producers refused to let him rewrite it himself, and the production stalled out.